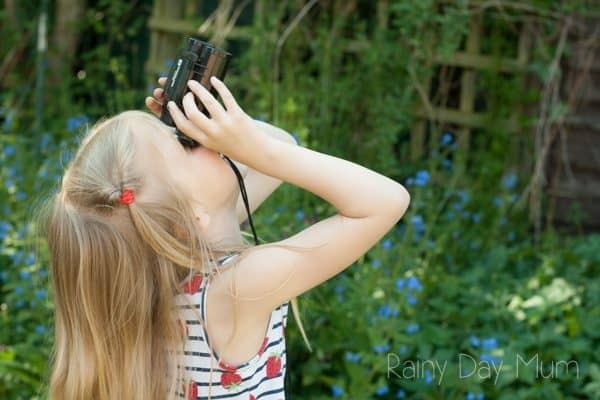 One of the reasons that I love nature is that it’s not complicated to get started exploring nature and summer is such a fun and interesting time to get out there. What’s more, the kids can do this independently and they will love it I promise you. 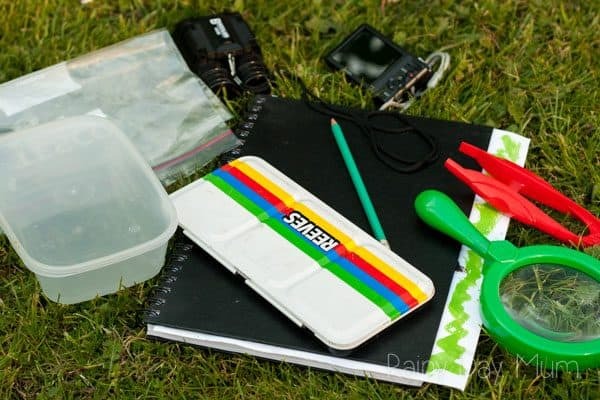 Earlier in the week I wrote about what makes magical summer memories for the kids and encouraging the kids to get outside is one that they can create on their own, but they do need some little kit to get started. There are a couple of pieces of the kit that you may not have at home but I’m guessing the majority of everything else you probably have or you can find a variation of. 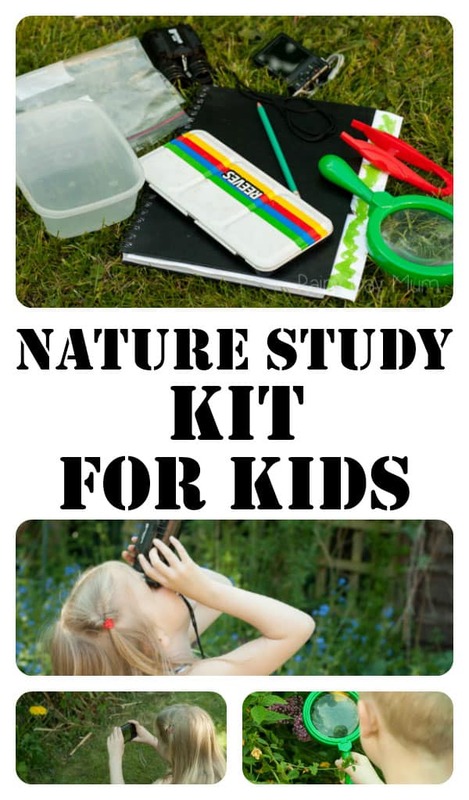 We put this all into an old backpack of the kids although I am planning to make a nature kit bag for the kids this summer and make sure that it has everything in at the end of the day if it’s been used. As I said I’m going to be making a bag for the kids but at the moment, we use just an ordinary waterproof backpack they can put it down on the ground and no matter how wet it is the stuff inside stays dry. 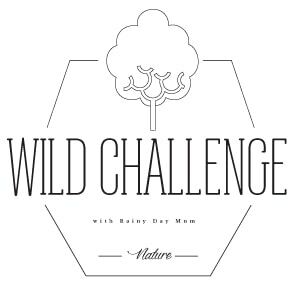 We don’t have a big nature display at home – just a window sill and if we brought home everything that they wanted it would need to be the size of a museum instead we use a camera – first it was a camera on an old smartphone of mine and last birthday we brought the kids little point and shoot digital cameras. 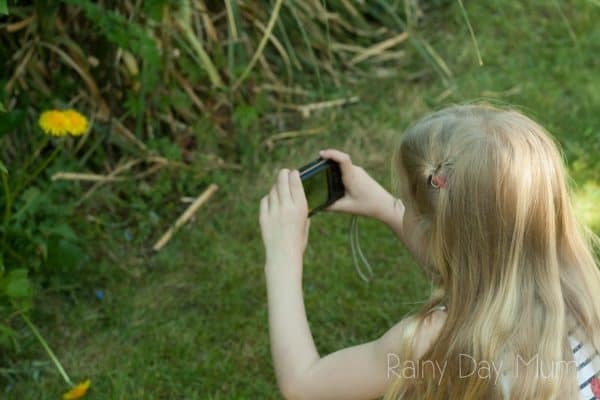 We take pictures of anything that we find that they want to after we get home we sort them out and then use them for our digital journalling or print to add to the nature display at home. 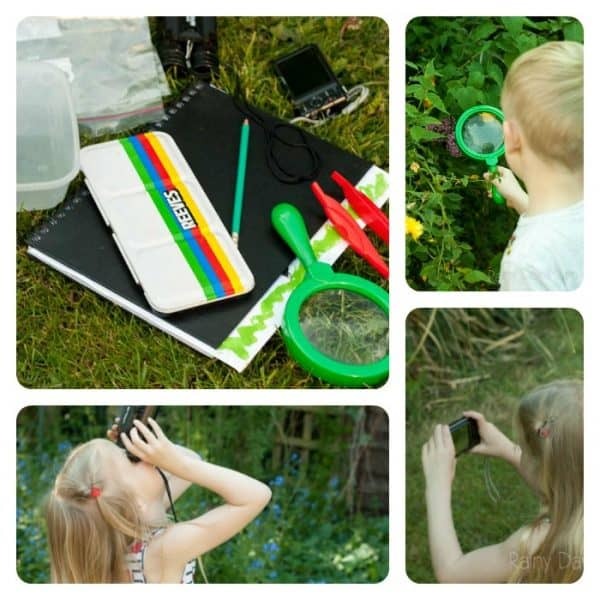 When we started out the kids just had felt tip pens and pencils in a little bag within the nature kit but now that they are a little older we have a pencil, a watercolour palette, small bottle of water and a little pot, pencils and paint brushes. 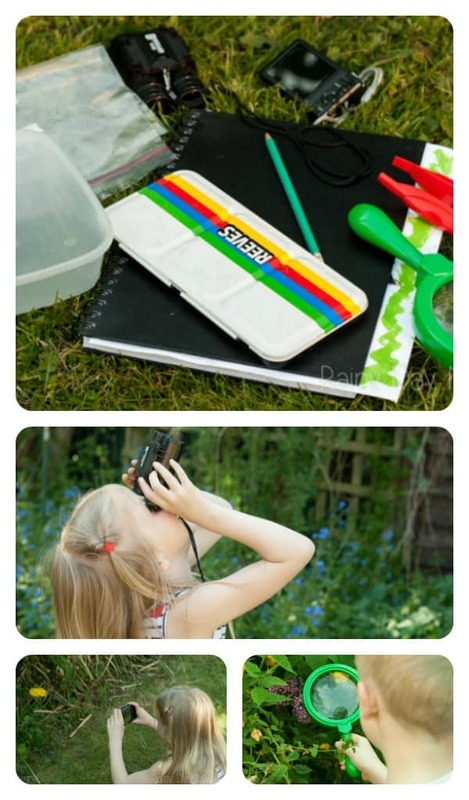 Felt tip pens are great for little kids but they are not great for nature pictures and the kids will spend much longer laying on the grass painting the things that they see than they will when colouring with felt tip pens. Kids want to pick up what they find and some things are fine to pick up but others aren’t so I try and encourage my kids to use tweezers – you could use a set like the ones in the picture above or for older children a set from your nail kit will work just as well. 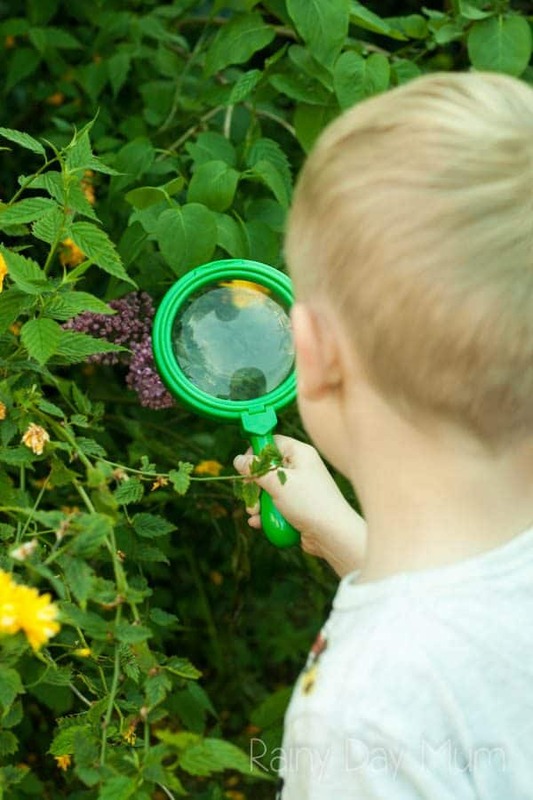 Very young children that want to play nature explorers may find tweezers difficult so you could use a pair of kitchen tongs with them. Whether it’s a trip to the beach or to the woods there is always something to collect and we never have enough pockets to collect everything in so I put some Ziplock Bags into our nature study bag and every single time I end up digging out my reusable bag from the car to carry more stuff as well. 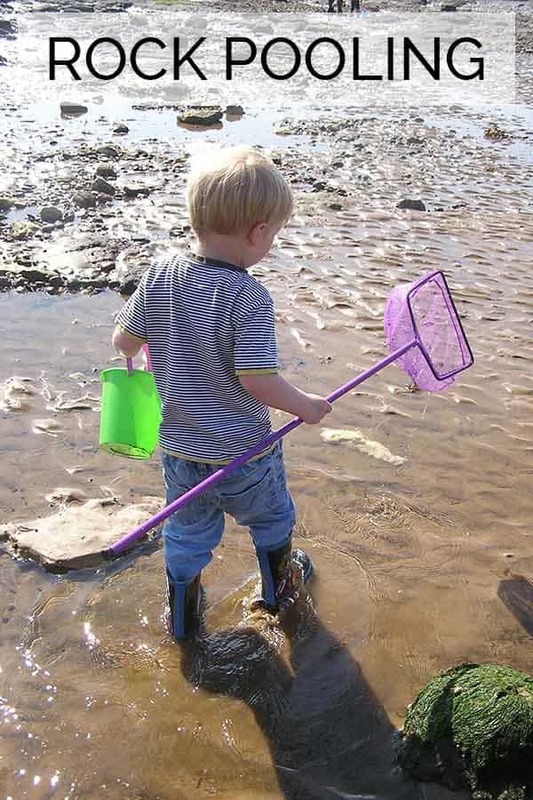 We slip in a small plastic box – something like a resealable takeaway container than if we find something alive that the kids want to bring home like a snail or bug we can easily put it in the box bring it home and then release it in the most suitable habitat for them in our garden. To help me and the kids identify what we are looking at it’s always a good idea to put in a pocket nature guide – depending on where you live you will need different ones so I’m not going to make a specific recommendation but pop along to your local bookshop, have a search on Amazon.com or Amazon.co.uk to find the one most relevant to your area. I love this idea! 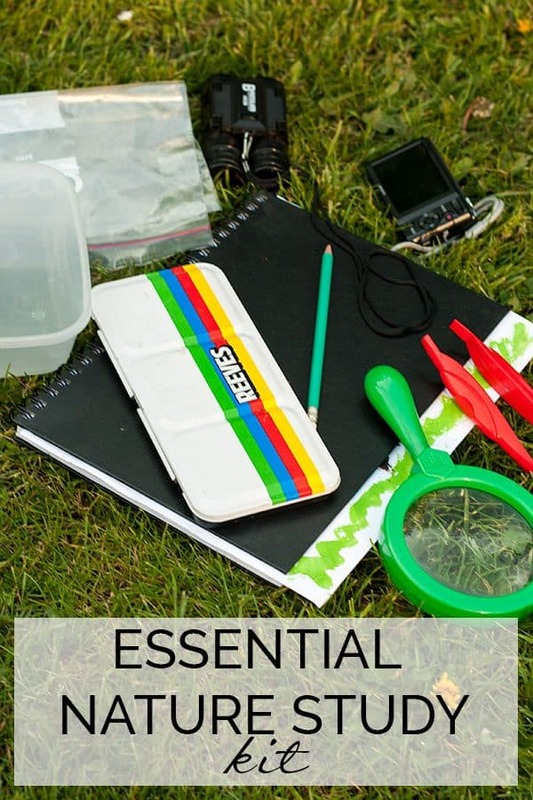 I’m planning lots of little adventures over the summer and this is a great list of things to take along! This is such a great idea! I love your kit picks. A definite share for our FB friends at everingreen.com. Thank you! Great ideas! Thank you! I have another item that we love to add to our nature study kit – jewelers loupes in varying sizes, allowing you to use both hands while getting up close. If you haven’t yet discovered The Private Eye by Kerry Ruef, I highly recommend it!